Welcome to this site about a fascinating railway! 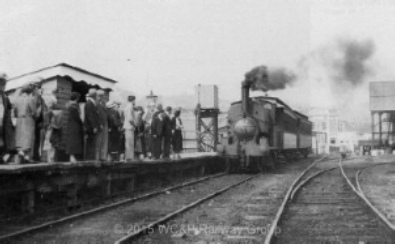 This photo showing a train headed by locomotive No. 5 arriving at Clevedon from Portishead in 1937, is reproduced with permission from The Weston, Clevedon & Portishead Railway by Peter Strange published by Twelveheads Press. The WC&P Railway Group is looking for artefacts from the WC&PR. In particular at the moment we’re looking for a Clevedon cast iron nameplate from which to make a replica. We hope you find this site easy to navigate. Most things are interlinked, but if you wish you can search the site from the menu button or try the Site map.